Us versus Them IIoT Workplace Mindset does not Work. Here's why. Us versus Them IIoT workplace mindset doesn’t work. Especially in today’s industrial Internet of Things work environments. First, equipment and systems are connected. Then, people are interconnected to people. Finally, work teams in one country intersect with other global teams to create enduring engineered and business outcomes. So why does Us versus Them IIoT workplace mindset still exist? After all, this mindset persists as one of the largest Elephants in the Room of IIoT organizations and institutions. Our goal? Jettisoning this impediment to collaboration. Creating forward momentum for IIoT workplace progress. To initiate Elephant elimination, download my newest team dynamics assessment. Us versus Them IIoT workplace mindset impedes workplace evolution. The IIoT feels like it sort of crept up on everyone, didn’t it? Yet that is not the case. Advances in robotics and plant automation “happened” over the past 30 years. However, the impact of the internet and software on connectivity gained critical mass over time. In the past 5 years, these engineering and IT plate tectonics were recognized as Industry 4.0, the Fourth Industrial Revolution or the industrial Internet of Things. Initially, ask yourself: Does the IIoT workplace feel fluid and comfortable? Then consider whether there, literally, is work to be done? Most importantly, evaluate how well employees from one professional discipline (“Us”) collaborate with professionals in other disciplines (“Them”). Because the hallmark of the industrial Internet of Things is digital transformation of the enterprise. Digital transformation requires enlightened IIoT mindset promoting collaboration. How digitally-savvy is the workforce? Take a walk around the current workplace. It is multigenerational. However, chances are the workforce strategy responsible for hiring these individuals wasn’t created for an IIoT ecosystem. Consider whether the organizational business model still contributes to people working more comfortably while in departmental silos? Then assess whether big data and predictive analytics are shared across the organization or hoarded in data kingdoms more fiercely protected than a Game of Thrones subplot? Finally, evaluate how equipment and software have evolved. Compare with business models and work environments, Does the workplace reflect the same level of interoperability as IIoT manufacturing environments? Liberate yourself from Us versus Them IIoT workplace mindset. Collectively, an IIoT workplace can’t move forward towards a more collaborative IIoT horizon until people identify what is holding them back. Most of the time, the pervasive nature of legacy Us versus Them IIoT workplace mindset is the root cause of IIoT workplace incompatibility. 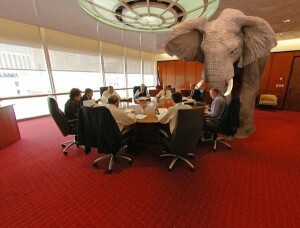 Perhaps everyone’s first order of business is to identify all the Elephants lurking in IIoT workspaces. That is a cross-functional collaboration exercise tailor-made for IIoT work environments. When people focus on a common denominator and a bigger picture, the workplace feels less like a battleground. The seeds of collaboration are planted. Get started by downloading my newest team dynamics assessment tool. Then, set out on an adventure to identify Elephants in IIoT work spaces! Start by communicating across cultural as well as professional barriers. Recognize that we initially over-think issues. Eventually, we become brutally honest about what makes us uncomfortable. Finally, we take that walk onto the plant floor and talk to people who may not be just like us. Ultimately, issues are best overcome by asking people what they think. Consider the business case for digital transformation on the plant floor catalyzed by replacing what was familiar, manual calipers, with what was new: digital calipers. Ponder what happened when a sales team asked slaughterhouse workers – not the buyers – about how they actually use products and equipment. They literally got their hands dirty working with end users and increased productivity and profitability. Ultimately, overcoming Us versus Them IIoT mindset is critical to workplace development. My advice: Take a workplace safari. Start identifying all the Elephants in the Room. I guarantee you will “see” the IIoT workplace with a new set of eyes. You will gain a new perspective about the workplace, as well. And in my IIoT Playbook, you will grow leadership skill sets. Your roadmap starts here. Download my newest team dynamics assessment tool. For starters, let me know what you discover. Then, and more importantly,tell me how you gain forward momentum through collaborating.